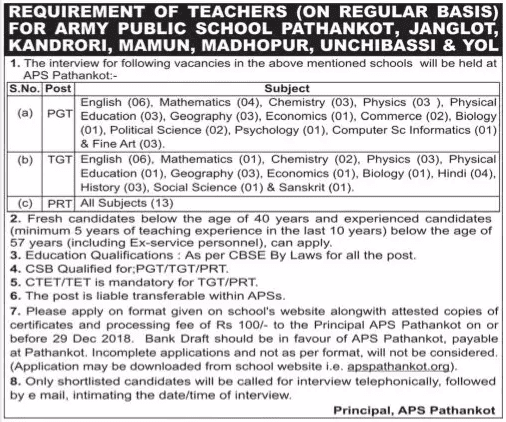 Army Public School, Punjab has recently given notification of 73 PGTs, TGTs and PRTs vacancies for the various regions. You can apply for the Army Public School Punjab Recruitment 2018 on or before 29.12.2018. APS Punjab Recruitment 2018-19 latest notification is out. As per the Notification, there are 73 PGTs, TGTs and PRTs vacancies. The educational qualification is as per the CBSE Bye-Laws for all the post. The maximum age limit is 40 and 57 years. If you are looking for Teaching Jobs in Army Public School then this article is going to be very helpful for you. Name of Department: Army Public School at Pathankot, Janglot, Kandrori, Mamun, Madhopur, Unchi Bassi & YOL. As per the CBSE Bye-Laws for all the posts. CSB qualified for the PGT/ TGT/ PRT. CTET/ TET is mandatory for TGT/PRT. As per the Punjab Govt. norms. As per the APS norms. The selection is going to be on the basis of interview. Only shortlisted candidates will be called for the interview telephonically. Bank Draft of Rs. 100/- to in favor of APS Pathankot, payable at Pathankot. You can send your applications along with the attested copies of certificates and processing fee/ application fee to the Principal APS Pathankot on or before 29.12.2018. You can check the APS Punjab Result or Interview List from the official website. Army Public School (APS) has various branches in almost every famous city. Recently various Teaching and Non-Teaching jobs are announced by the Army Public School. If you want to work in a school or looking for School Jobs then this is a big opportunity for you. Here we are going to give you details on Army Public School Recruitment 2018. APS Recruitment 2018-19 Notification is out. As per this notification, there are various TGT, PGT, PRT, and other vacancies. The educational qualification is graduation, post graduation (Master’s degree) and other as per the department rules. The age limit fixed by this department is 40 years. So the candidates having the age of 40 years can apply for Army Public School Vacancy. This is a big chance for the candidates who want to apply for Teaching Jobs in Schools. The educational qualification for APS Jobs is graduation, post-graduation, and B.Ed. degree. The selection process is going to be on the basis of the computer proficiency test and interview. A CPT will be conducted by the department and the candidates clear the same will be called for interview. You can send your application form for these vacancies in army public school to their concerned offices. The dates are different as per the vacancies. Apply for these jobs before the time runs out. Kindly check the above-given links for the latest recruitment notification being announced by the department. If you have any query related to qualification, salary, age and other then you may ask us by commenting below. We are always here to help you with your queries. Now when come Army Public Schools Post in Abohar & Bathinda.